The eastern long-necked turtle (Chelodina longicollis), also known as the snake-necked turtle, is a common pet in its native Australia. To keep these animals healthy you'll need a habitat that recreates this environment. Experts in reptile rearing consider long-necks one of the most challenging turtle species to keep as pets. 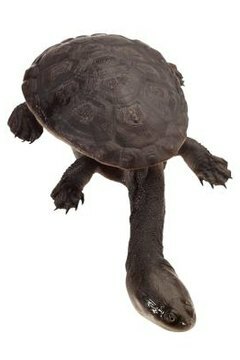 Find a reliable veterinarian who can provide proper care for long-necked turtles. Do this before you acquire your pets. Set up your turtle aquarium where it will receive some natural sunlight and the water temperature will remain reasonably stable. Arrange the aquarium elements so that your snake-necked turtles will have terrestrial and aquatic living areas. The substrate should be a layer of gravel across the entire bottom, topped by embankments made from a mixture of sand and peat moss for the terrestrial areas. Make sure the aquatic area is deep enough that your turtles can swim freely. The water should be at least as deep as the turtles' shells are long. The terrestrial area should be large enough for your turtles to walk, sit and bask comfortably. Install a constant flow water filtration system in the aquatic area. This will keep the water clean and aerated for when your turtles are submerged. Add a water heater to your aquarium if it's needed to keep water temperatures between 72 and 78 degrees F. Improper temperature is a common cause of illness in turtles. Monitor the water temperature with an aquarium thermometer. Arrange logs, leaves and rocks so your turtles can use them as hiding places. Include logs for hiding in the aquatic area as well as in the terrestrial space. Provide UV and blue-green light for your turtles. They need ultraviolet light to be able to synthesize vitamin D, and blue-green light is necessary for proper eating and activity. The lighting should be cycled to follow the same patterns as daylight. The UV light needs to be close enough to the turtles to be effective, and it should not pass through glass, plastic or water to reach them. Install a heat lamp above one of the rocks or logs in your aquarium. The warmth from this light will give your turtles a place to bask. The temperature in the basking area should be between 80 and 90 degrees F. The heat lamp should be left on overnight, but the UV light should be off overnight. Change the water twice a week. Change about 25 percent of the water at a time, making sure the water being added is dechlorinated and at the same temperature as the aquarium water. Changing too much at once can shock your turtles' systems. Regularly clean any waste from the water and land areas. Add aquarium salt as needed to maintain appropriate water hardness. Long-necks do well in water hardness of 140 to 210 parts per million. Use one cup of salt per 13 gallons of water. They also need water at a pH of 7.0 to 8.2, which is slightly alkaline. Testing regularly for water quality will help ensure a healthy environment for your turtles. Feed your long-necks a combination of prepared foods, fresh foods, and supplements. Prepared foods and supplements designed for reptiles provide balanced nutrition. Live and fresh foods can include fish, earthworms, crickets, roaches and superworms. These turtles are carnivores and benefit from the sport of hunting, so getting live food about twice a week keeps their life interesting. Young turtles need to eat every day, but full-grown turtles need to eat only every other day. Long-neck turtles reach maturity at about 4 to 5 years old. Snake-necks will eat as much food as they get and are prone to obesity, so feed them only what they need. Put your snake-necks in isolation if they bear any wounds. A small, simple isolation tank can be set up as a "hospital tank" to protect a healing turtle from further injury. Snake-necks, especially juveniles, tend to bite at whatever moves in their proximity, even if that's another turtle. Turtles also might bite each other as part of their mating ritual.  Snake-necks need to be in the water to feed and to relieve themselves, so keep this in mind when providing their meals.  If you are keeping more than one snake-neck in an aquarium, provide plenty of hiding places. This reduces aggression among cohabiting turtles.  You might want to feed your turtles in a habitat apart from their living quarters to keep water quality high. Your feeding tank can double as your hospital tank. ⚠ Always wash your hands thoroughly after handling your turtles or interacting with their environment. Turtles can carry pathogens harmful to humans, such as salmonella. ⚠ Transport your snake-neck turtle in a ventilated box with moist towels. Never transport a turtle in water. ⚠ UV lights are effective for only about three to six months. They should be replaced at least every six months to continue providing vitamin-synthesizing benefits to your long-necks. ⚠ Do not clean algae off your turtles' shells. This could damage the shell and your turtle's health.